In 1892 Canna Madame Crozy was described as being the GRANDEST CANNA OF ALL. Raised by Antoine Crozy and named by him for his wife. In 1893 at the World’s Fair in Chicago it was awarded a Bronze Medal. From 1892- Only those who are acquainted with the new class of cannas can realize what a grand flower we now have in the new sort, Madam Crozy. The immense flower heads of the deepest vermillion, gold bordered are double the diameter of a Gladiolus spike and these flower spikes or heads follow each other so rapidly that these garden plants are always in bloom. The petals are very wide and broadly rounded. It is especially in this size of individual flowers that Madame Crozy excels all other French cannas. The massive spike of flowers continue forming as the new shoots appear until the plant reaches its natural height of which is about four feet. The above is one of the descriptions I have for Madam Crozy where the name is spelt without the E in the word Madame. I have other printed descriptions that were published from 1890 onwards where this canna has been paper published as Madame Crozy. Is this just a form of error translation from French to English? 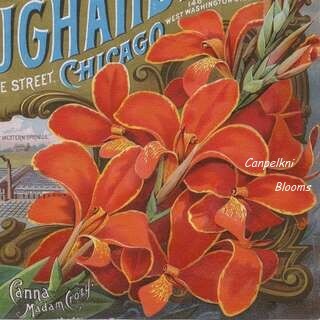 The only distributor of this canna to keep the name spelt Madam without the E was Vaughan Seed Store; they kept it spelt this way and paper published in 1892, 1893 and 1894, while other floral seed store companies spelt it with the E on the end. Summing up through my eyes Madame Crozy should be spelt with an E as this is the earliest reference I have and could find, however I have other paper publications where a few other cannas have had their names spelt wrongly too, so I’m very open minded to the correct spelling of this cultivar and the way that Mr. Crozy himself would have spelt it.